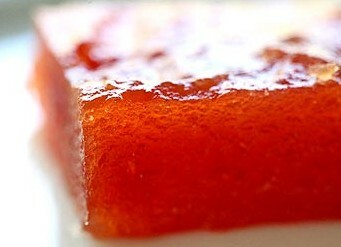 Membrillo is a popular Spanish paste made from quince and served with Manchego cheese. Place quince pieces in a large saucepan (6-8 quarts) and cover with water. Add the vanilla pod and lemon peel and bring to a boil. Reduce to a simmer, cover, and let cook until the quince pieces are fork tender (30-40 minutes). Strain the water from the quince pieces. Discard the vanilla pod but keep the lemon peel with the quince. Purée the quince pieces in a food processor, blender, or by using a food mill. Measure the quince purée. Whatever amount of quince purée you have, that’s how much sugar you will need. So if you have 4 cups of purée, you’ll need 4 cups of sugar. Return the quince purée to the large pan. Heat to medium-low. Add the sugar. Stir with a wooden spoon until the sugar has completely dissolved. Add the lemon juice. Continue to cook over a low heat, stirring occasionally, for 1-1 1/2 hours, until the quince paste is very thick and has a deep orange pink color. Preheat oven to a low 125°F (52°C). Line a 8×8 baking pan with parchment paper (do not use wax paper, it will melt!). Grease the parchment paper with a thin coating of butter. Pour the cooked quince paste into the parchment paper-lined baking pan. Smooth out the top of the paste so it is even. Place in the oven for about an hour to help it dry. Remove from oven and let cool.